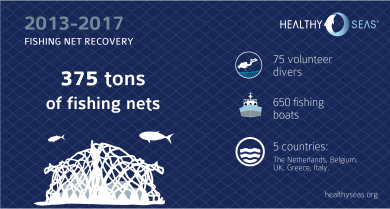 The Healthy Seas initiative’s call for used and discarded fishing nets was a raving success: 15 tons of nets were brought in this summer! 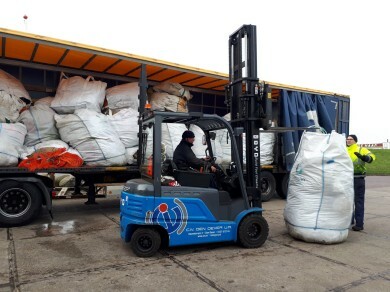 The salvaged nets are being stored in the first Healthy Seas depot in Scheveningen harbor, the Netherlands, and will be recycled to brand new beauty at the end of the salvage season. In March this year, the Healthy Seas partners launched an appeal to send in discarded fishing nets. 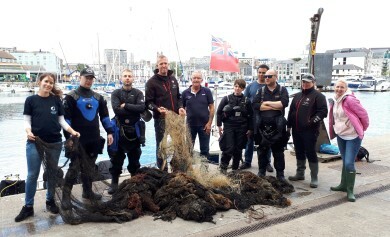 Since then, diligent divers have been taking the nets they find to the Healthy Seas reception and collection facility in Scheveningen. 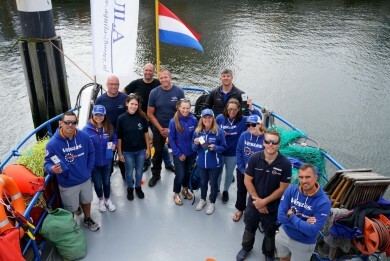 Recently, the Dutch salvage company PAN Salvage dropped off a whole 2,000 kilograms of old fishing nets. Well done! Healthy Seas is very pleased with these contributions and calls on all people to send in discarded nets for recycling. So, bring it on – every kilo counts! Discarded fishing nets are a huge problem. According to a joint report by the Food and Agriculture Organization (FAO) and the United Nations Environment Programme (UNEP) there are approximately 640,000 tons of abandoned fishnets in our oceans. That makes up one-tenth of all marine litter. These nets degrade extremely slowly and remain in the marine ecosystem for hundreds of years. They pose a serious threat to dolphins and other animals, such as turtles, crabs and marine birds, which very often get entangled and die. Removing the nets is a good start. However, if fishing nets are recovered at all they are usually just dumped into landfills or burned. We at Healthy Seas have found a solution that goes much further than just cleaning up the mess. As part of our initiative, we also regenerate the nylon from the nets and turn it into first grade ECONYL® yarn. The regenerated yarn is of such high quality that it is used to create new textile products, such as socks, swimwear, underwear and carpets. It’s a journey from waste to wear – and a very beautiful journey it is! Share the post "We’re piling it on! 15,000 kilograms of discarded fishing nets for re-use"